Discover this life’s lessons and purpose when communicating with your past life self. During the regression, as the client you are put into a relaxed, hypnotic state as you are brought back to a life which will be examined. As the therapist, I will continue to guide you throughout the entire journey while you experience different aspects and important events in that lifetime. During the session, we are both in constant contact about what is happening, so that guidance can be tailored to the specific issue you are experiencing at the moment. 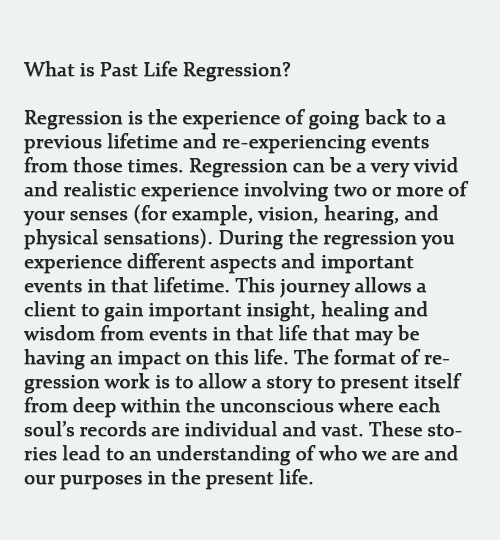 Our goal in the regression is to bring back all the wisdom, gifts, healing and blessings from that time so you can live more fully and completely in this lifetime as there is a true connection between present-and past-life experiences . As the story of a particular lifetime is revealed, most people can identify themselves in that life, although they realize they have a different body and are in a different time and location. Other people recognized in the story often exist again in our present life. Following the regression, some time is usually set aside to “process” the experience and discuss what you may have learned about that life to benefit the here and now. You will receive a recording of your session for future reference. Typically, a session lasts 1 1/2 hours. Readings provided by Gina are for guidance only and are intended to offer insight into your personal life. All readings and questions answered by Gina does not in any way constitute medical, legal or financial advice and are subject to your own interpretation and judgment. Your decisions, including any actions you take, with the information that Gina offers in a reading, is based on your own personal responsibility and choice. 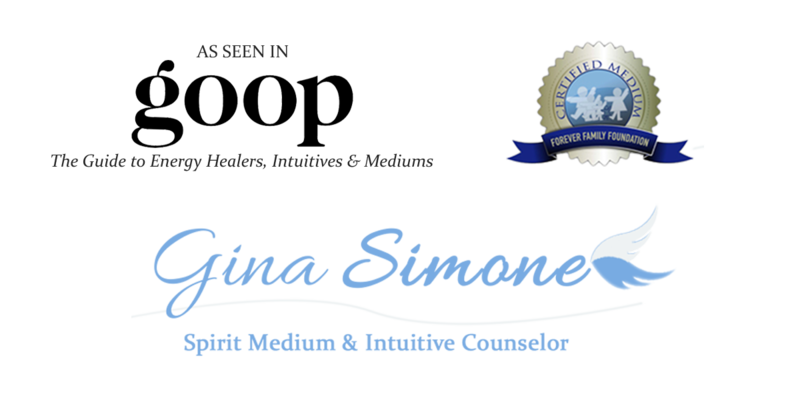 Gina Simone will not be held liable for any damages resulting from the use of this website or as a result of any reading, healing, class, event or appointment with her. For legal reasons, we must advise you that the readings are for entertainment purposes only. Services provided by Gina are not a substitute for professional advice, and it is advised that you seek assistance from the relevant qualified expert.